The wait is over, the identity of the new tenant of the house on Irongate Street is none other than H.G. Wells. 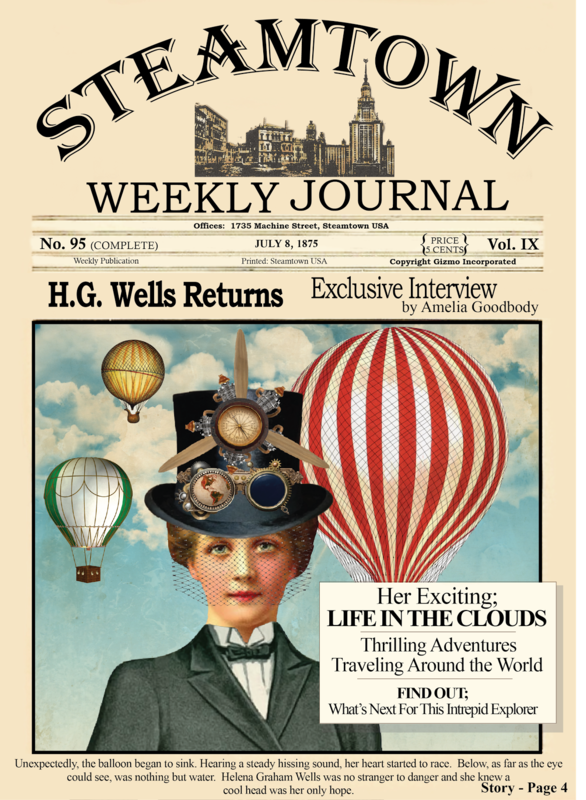 The Steamtown Weekly Journal has all the details with Amelia Goodbody snagging the exclusive interview. She covers topics like “Her Exciting Life in the Clouds”, “Thrilling Adventures Traveling Around the World” and “What’s Next For This Intrepid Explorer”. If you want to find out what happens next, you’ll have to subscribe to the Steamtown Weekly Journal. A girl after my own heart, H.G. 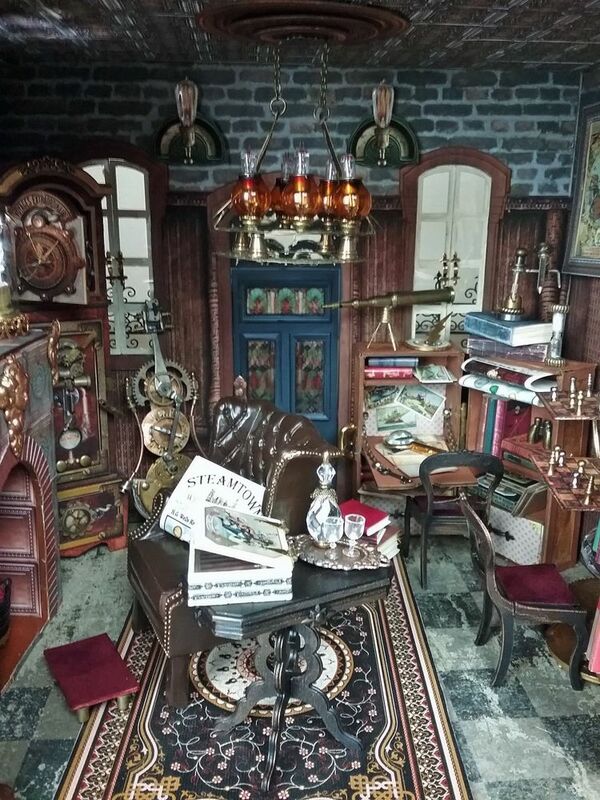 seems to prefer a cluttered eclectic style of décor. I love the brown chesterfield tufted chair with its velvet footstool. Next to the chair are her favorite cigars (Lucky Fellow) and a decanter with her favorite brandy. Bright lights and a warm fire make the room feel cozy. I see she is a cellist and that cello looks like nothing I’ve ever seen before. 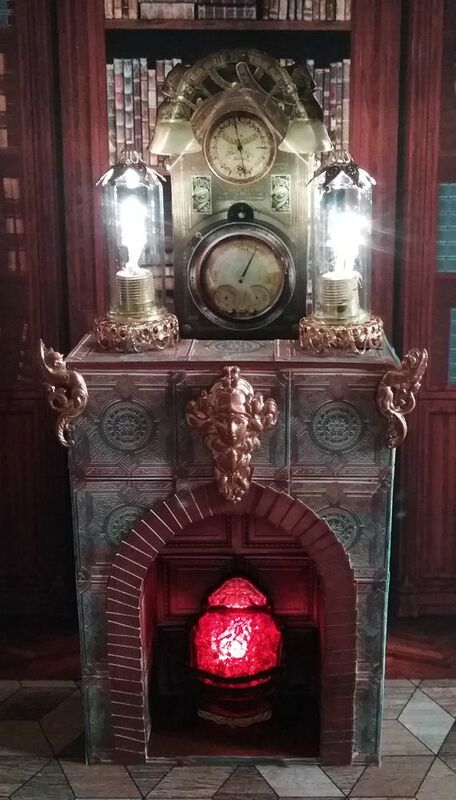 What an interesting clock, it looks like a mechanical wonder both inside and out. I wonder if this is a creation of Dr. Whatsit. 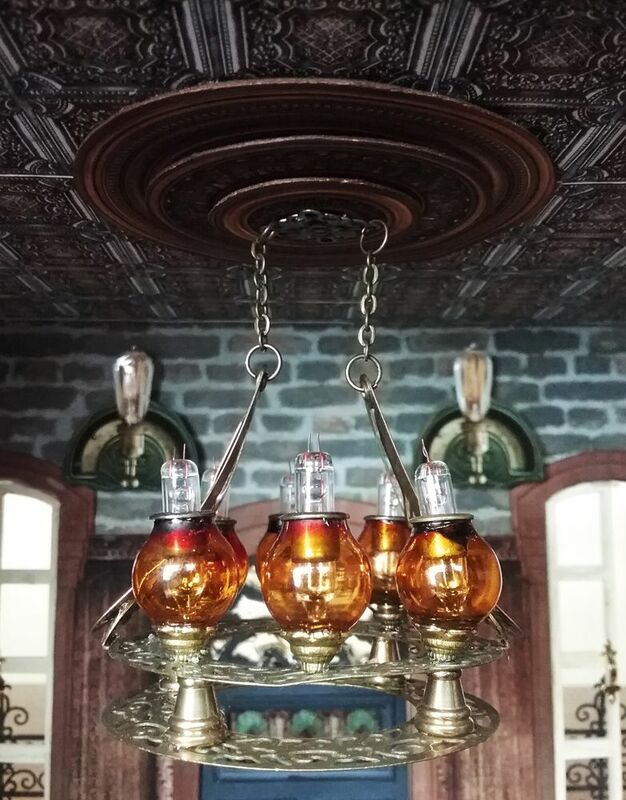 What a lovely and unique chandelier and the Edison wall sconces are also interesting. On the other side of the room, I can see some very interesting pieces. I bet she's taken that steamer trunk on several of her adventures. 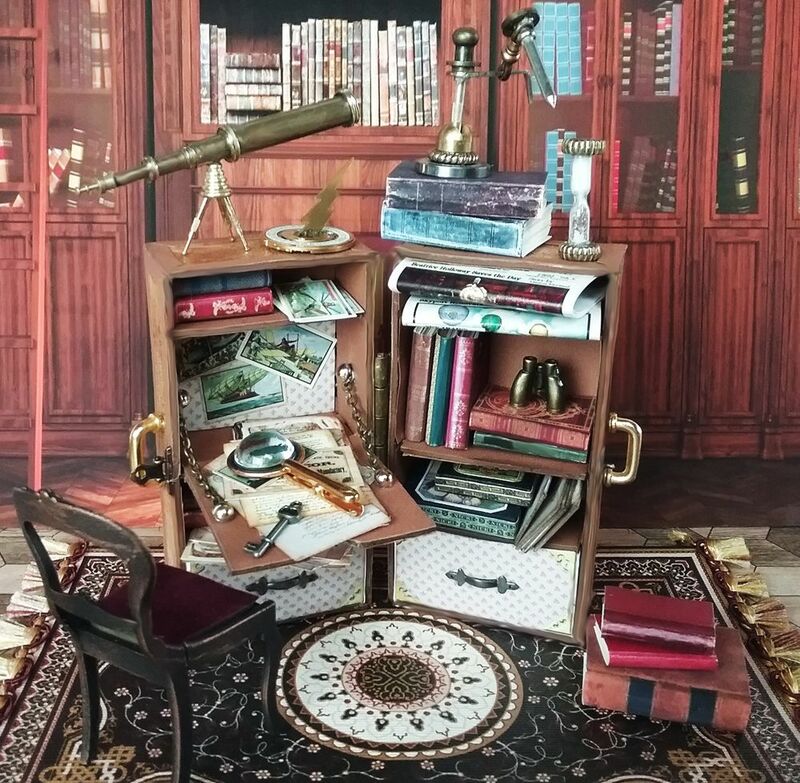 It looks like she also uses it as a desk for correspondence and I see several postcards from her travels. Looks like Helena is a fan of playing 3D chess. 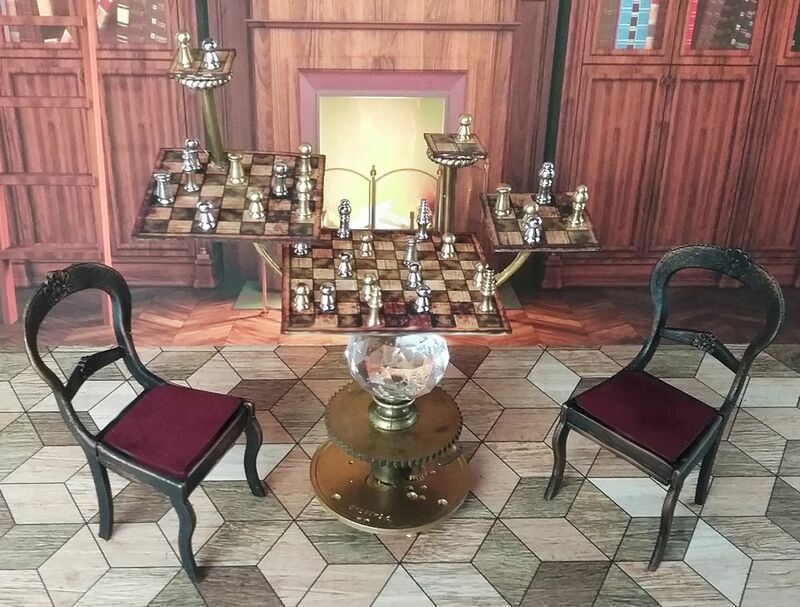 This set must have been custom made. 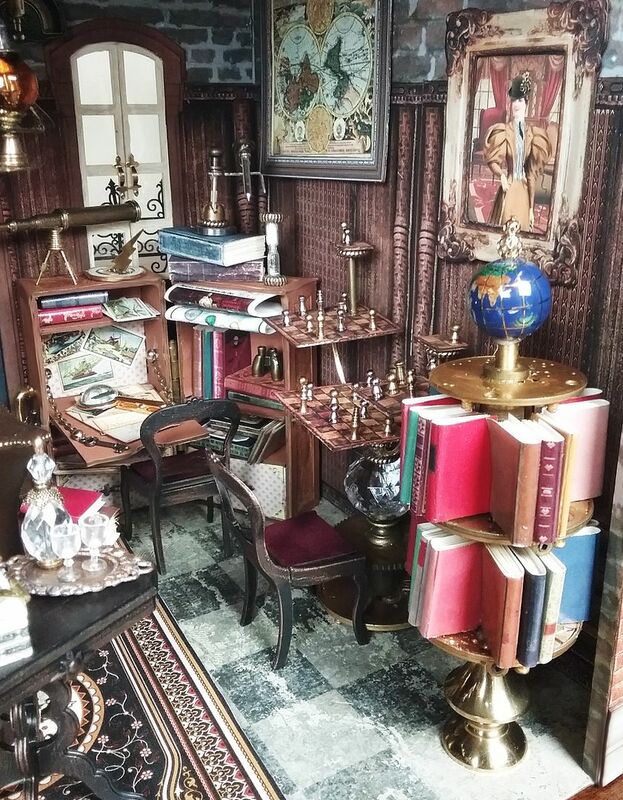 What a beautiful round bookcase crowned by an amazing globe. 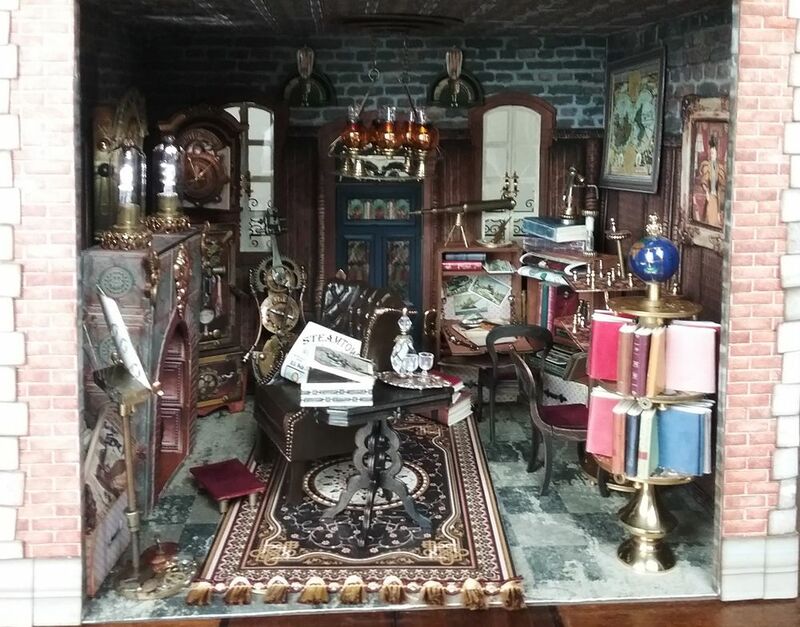 In this tutorial, I’ll cover how I decorated and constructed the pieces in the Steampunk Study (the first floor of the two-story house). 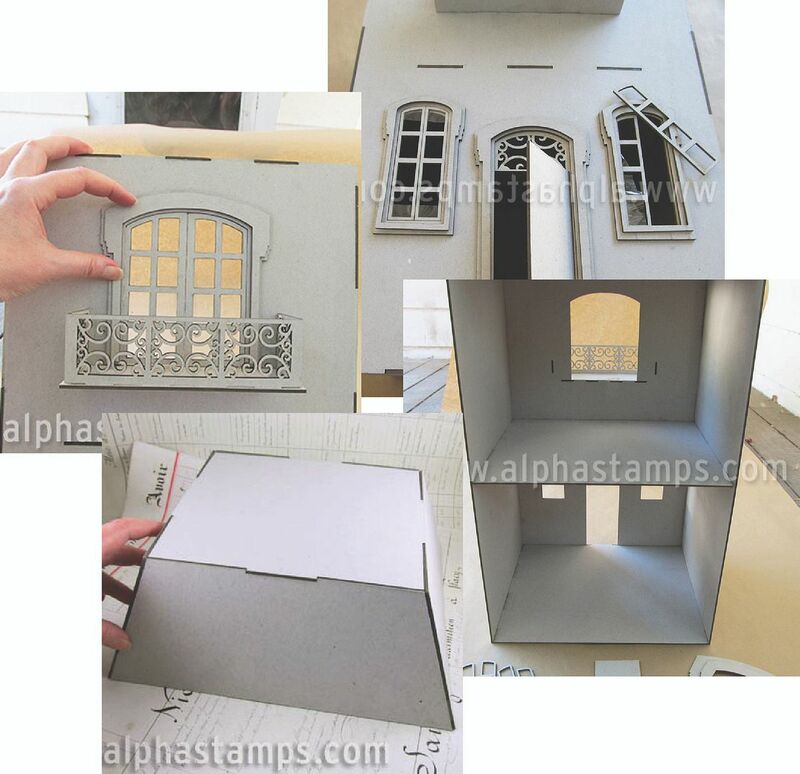 The project is packed with so many wonderful chipboard kits and embellishments. 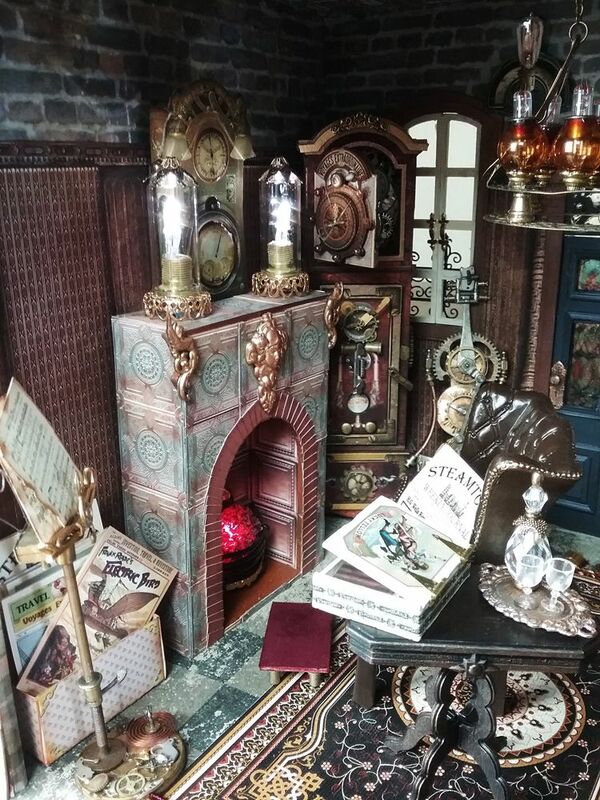 My favorite kits are the fireplace and the grandfather clock. 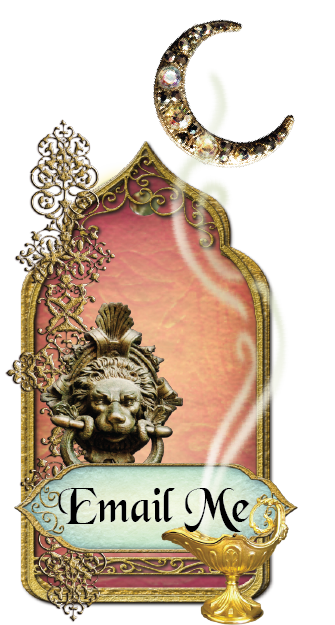 Some of my favorite embellishments are the inlaid globe bead, chess pieces, amber globes, and brandy decanter set. 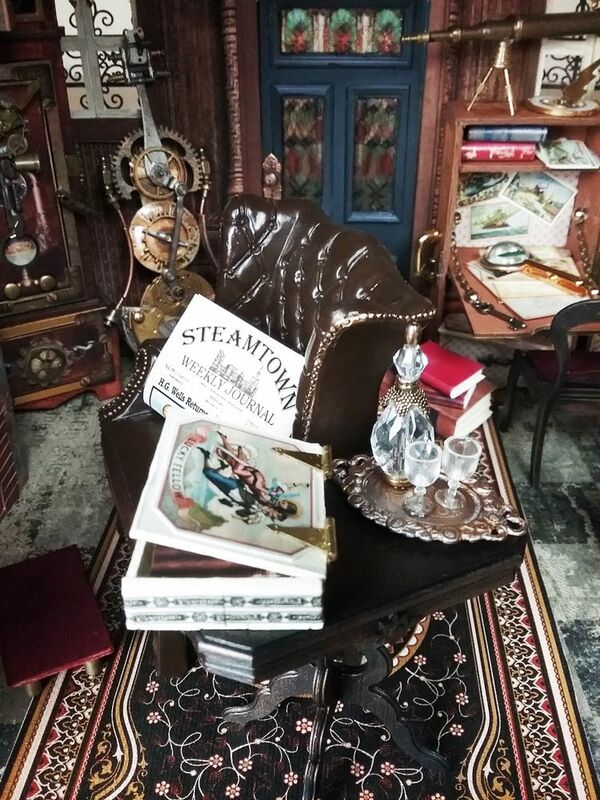 The Steamtown series of projects is just getting started. 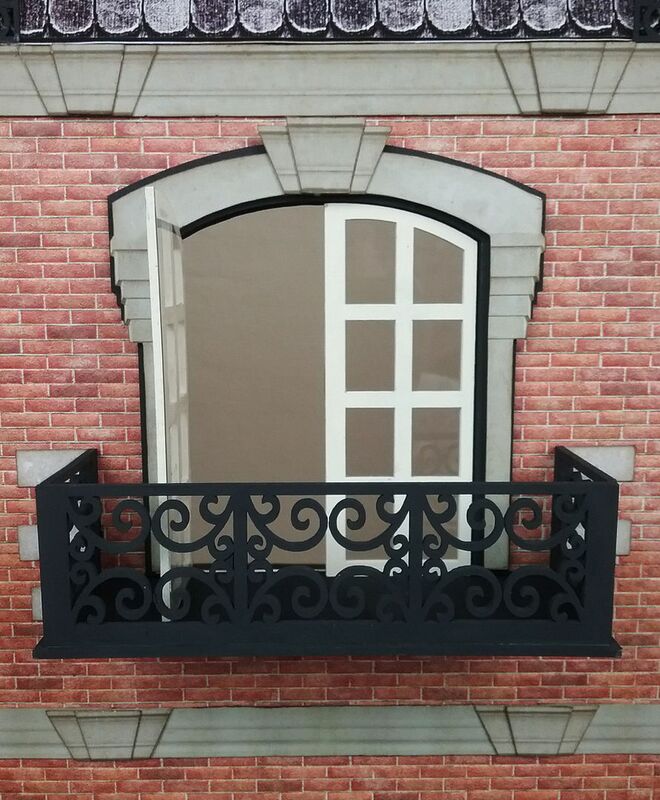 Stay tuned as in the coming weeks I'll be decorating and furnishing the second floor and adding other elements to the exterior. 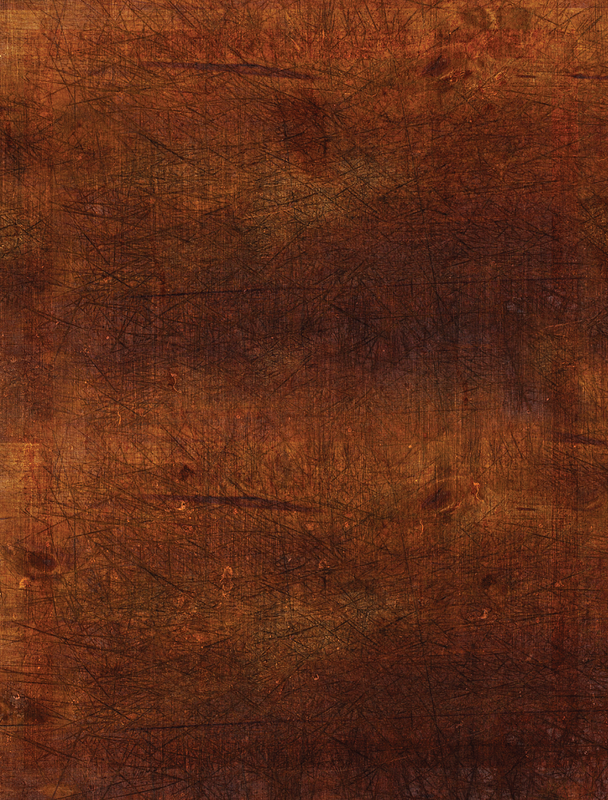 In addition to the house on Irongate street, there will be other Steampunk related projects that I'll keep under my hat for now. 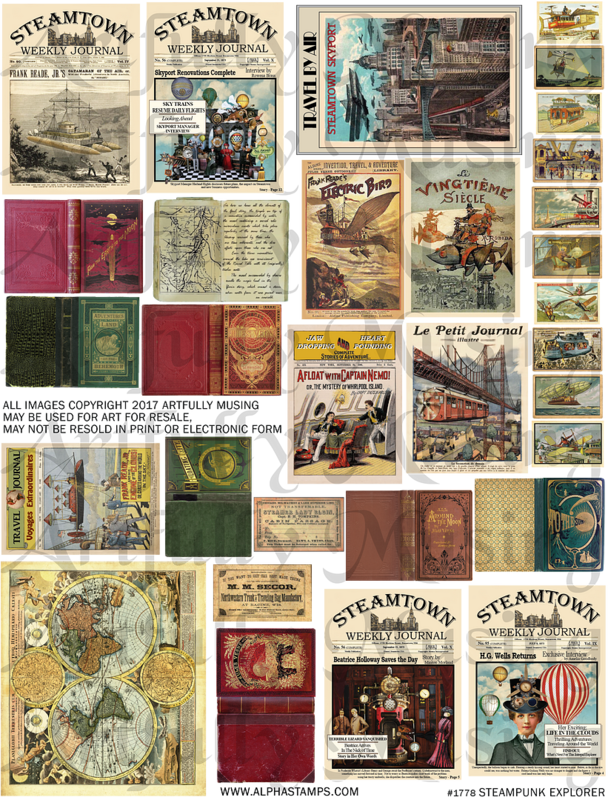 This collage sheet is filled with Steampunk themed travel journals/magazines, posters, postcards, books, tickets & a map for a total of 31 unique images. 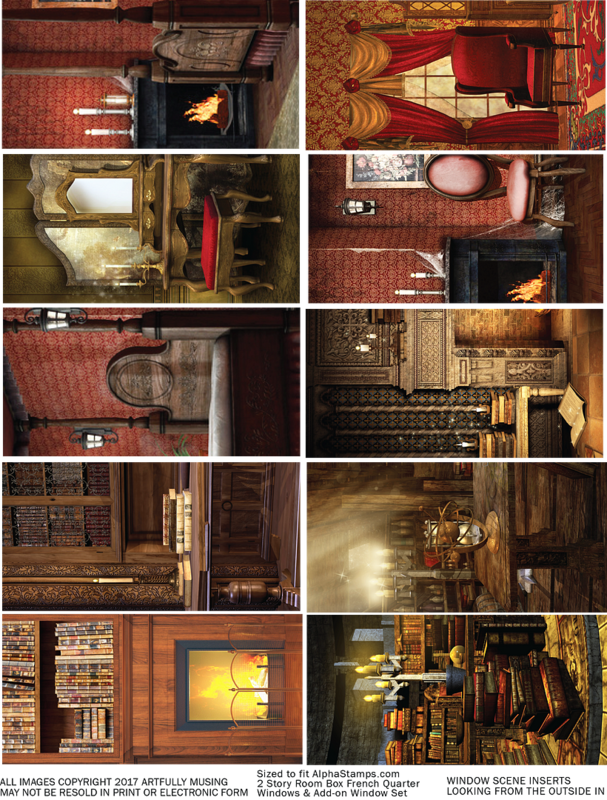 This collage sheet contains images to decorate a steampunk themed room. 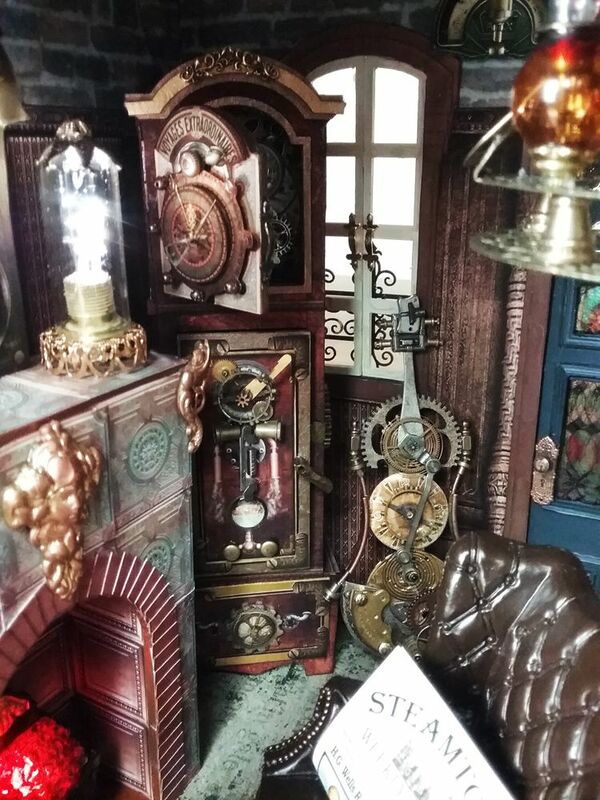 Included are: a grandfather clock, a mantel clock, a radio, a Victrola, a typewriter, a camera, chess boards to create a 3D chess set, 6 unique cigar box labels, and matching edgings, (sized to fit the chipboard Mini Cigar Box Set) and three sets of Edison light sconces. 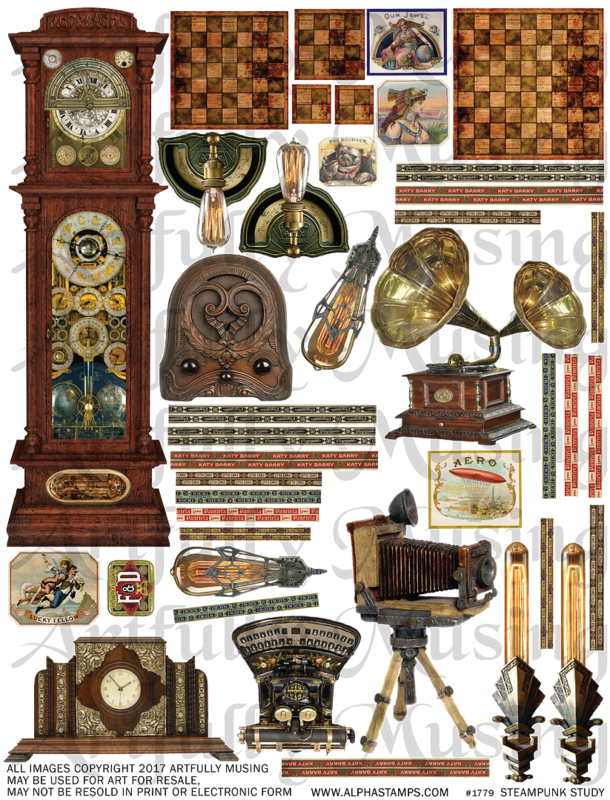 This collage sheet contains 8 unique steampunk machines, extra gauges, and Edison light bulbs. 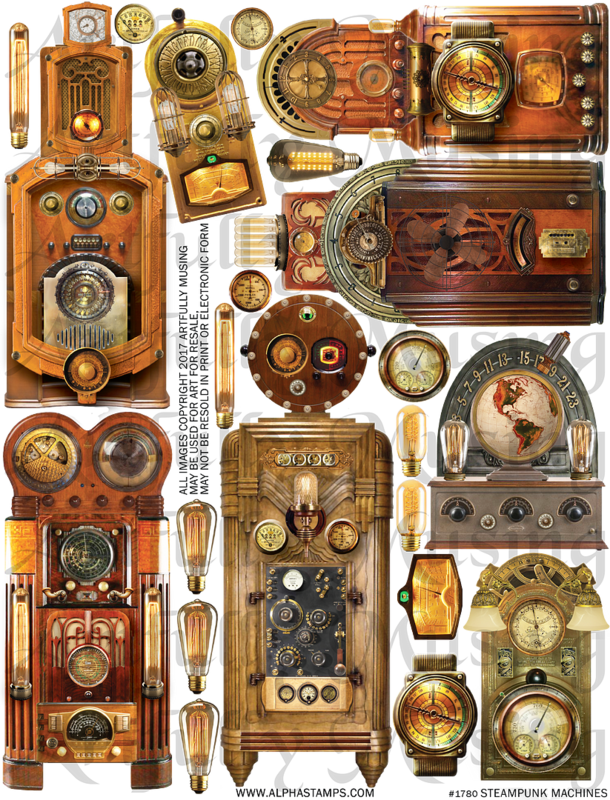 Each machine is loaded will all kinds of dials, buttons, knobs, gauges, lights and other mechanical items. Some of the machines are cabinets and some are brass wall plaques. 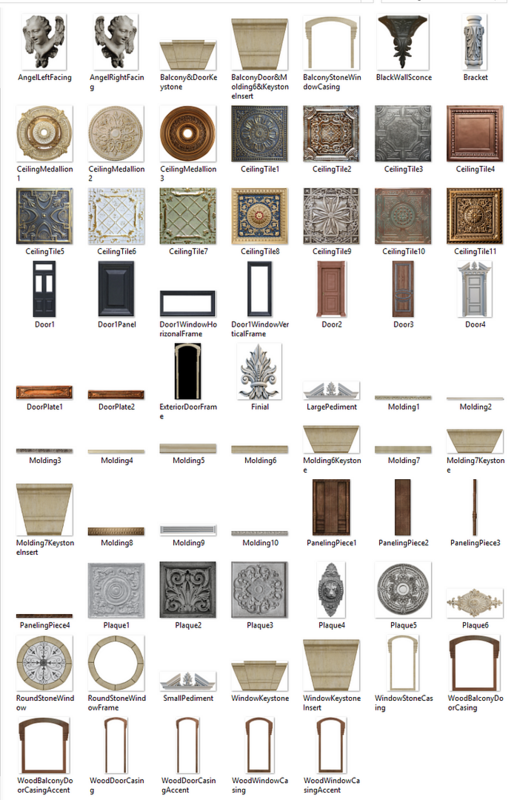 This is a smaller version of the Large Grandfather Clock Facades collage sheet that has been scaled to fit the 3D Grandfather Clock 1:12 Scale. 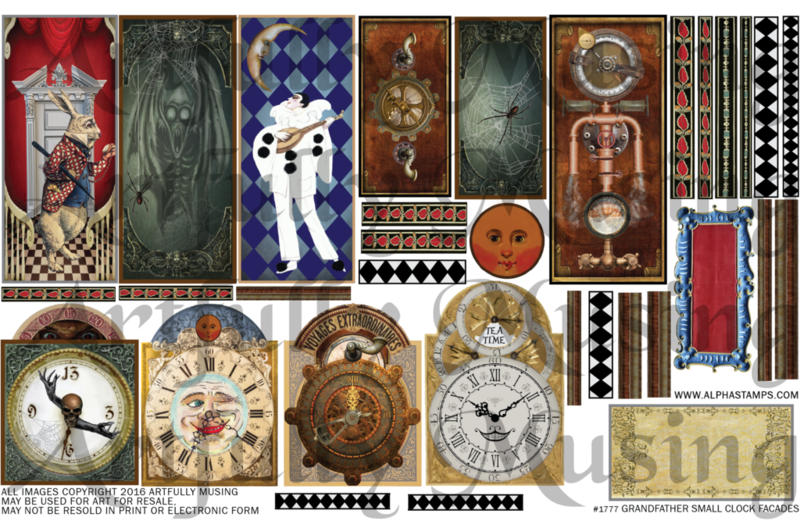 The sheet contains four different themes to choose from; Steampunk, Alice in Wonderland, Whimsical, and Halloween. 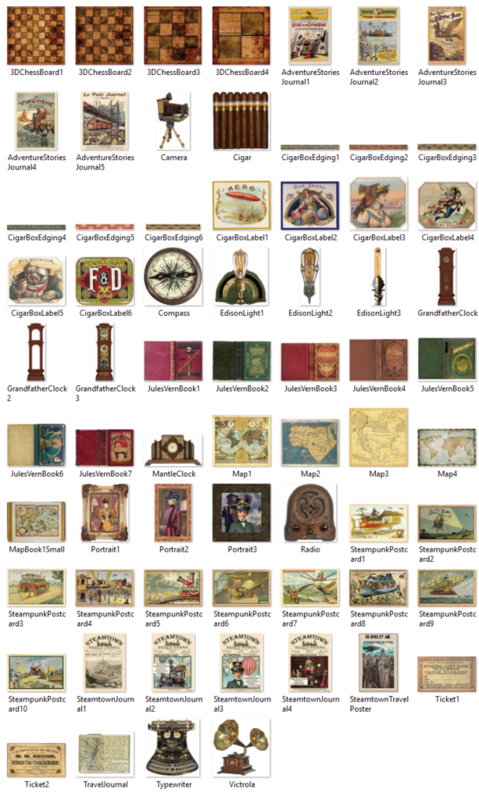 This set of 67 images includes all of the images from the Steampunk Explorers Collage Sheet, the Steampunk Study Collage Sheet plus additional maps, clocks, cigars, a compass, and framed portraits. 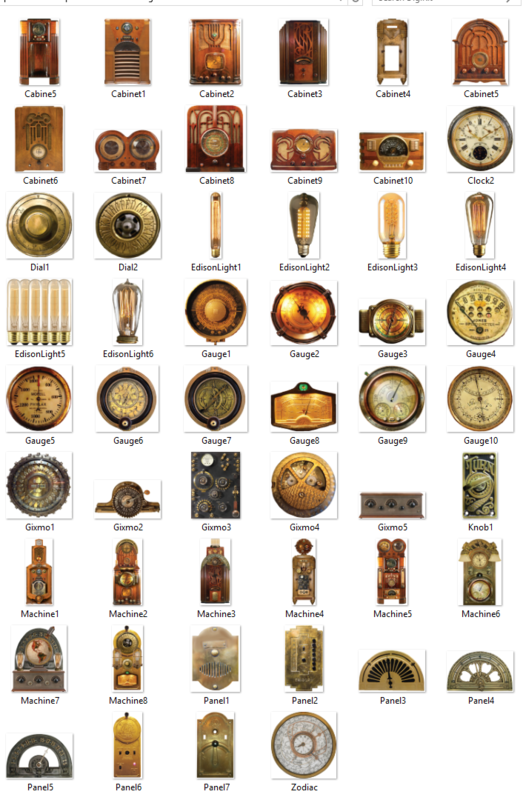 This set of 52 images includes all of the images from the Steampunk Machines Collage Sheet plus cabinets, Edison Lights, gauges, dials, panels and more. You can use these extra bits to create new machines or to make the constructed machines more dimensional. 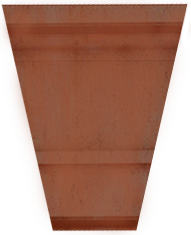 One is the taller center brick and the other is the small brick for laying around the arch. In Steamtown on Irongate Street is a beautiful house that has sat empty for too long. Rumor has it that a famous explorer has recently leased the house and will be moving in shortly. Gossip flies around town as the residents try to guess who will be the new tenant. 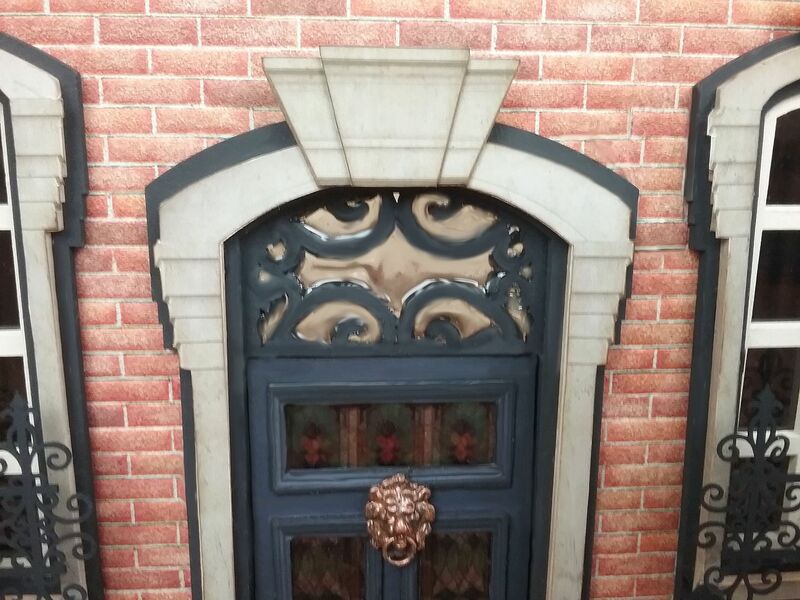 The brick house is beautifully trimmed in stone and wrought iron filigree. 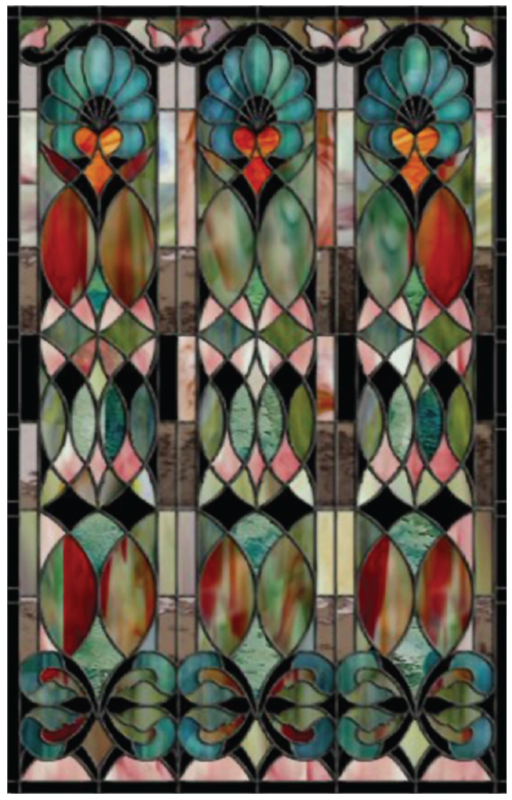 The front door and ironwork above are inset with antique stained glass. 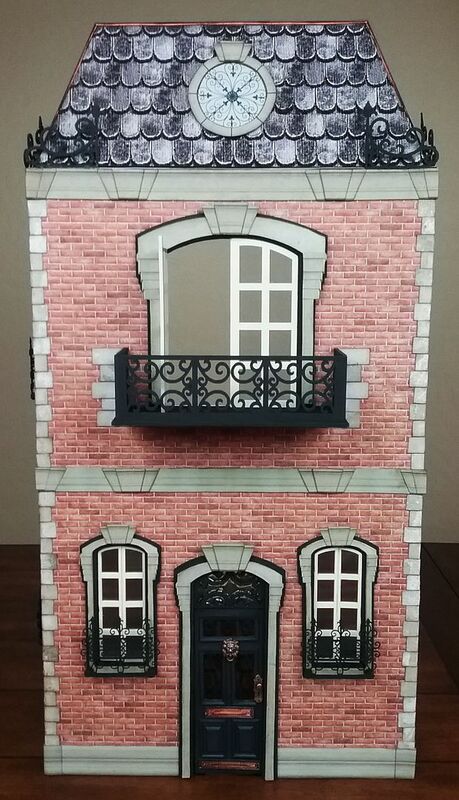 On the second floor is a lovely balcony with French doors. Although the inside is a bit worn, it still has a great deal of character. 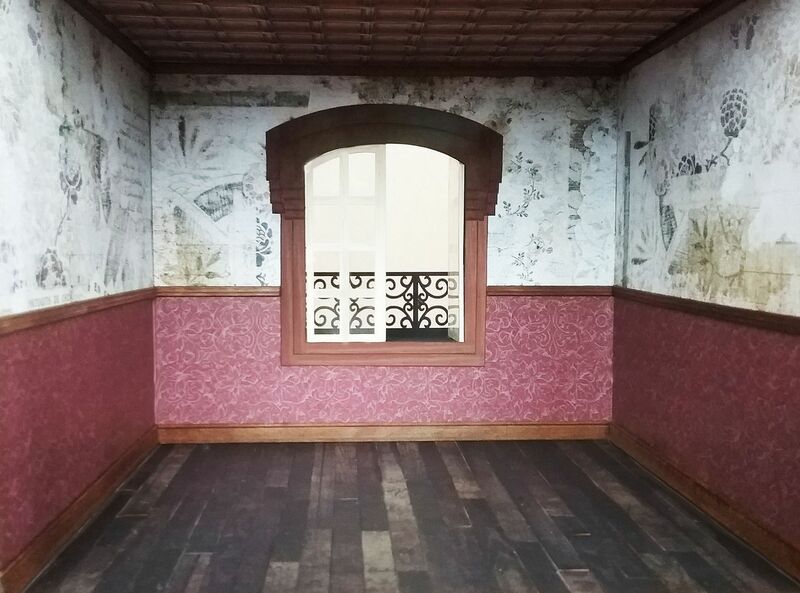 The walls downstairs are covered in dark wood paneling and the ceiling is made of tin tiles. Upstairs the walls are covered with faded paper and more tin tiles grace the ceiling. 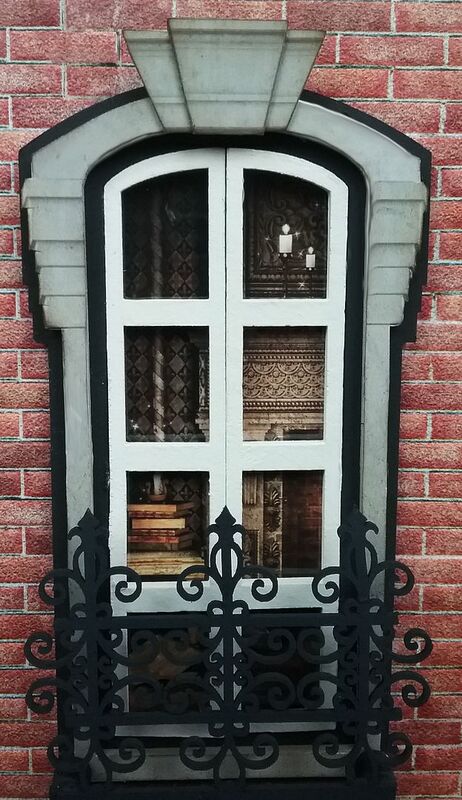 It’s a diamond in the rough and how fun it will be to see just what the new tenant does with it, surely bringing their love of travel, exploration, and adventure to the decor. 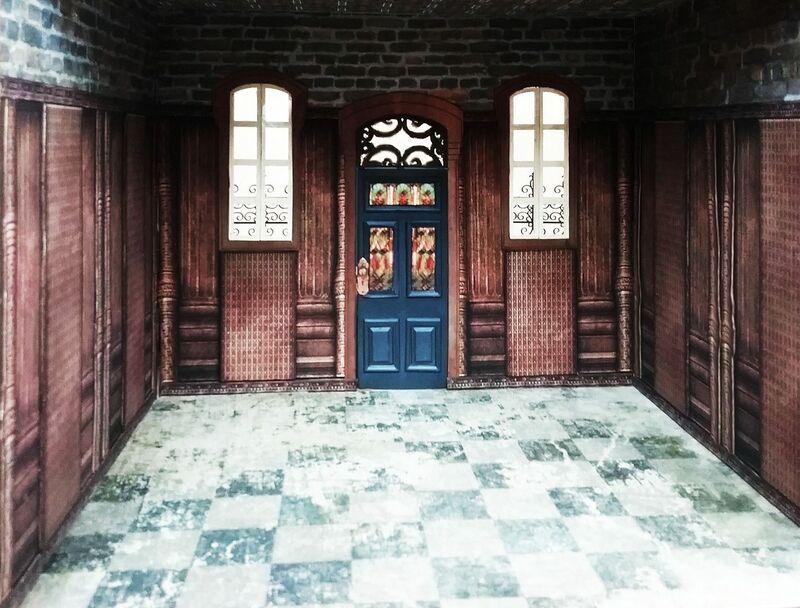 This project was made possible by a NEW amazing 2 Story House Kit, Add-On Roof Kit and Add-On Window Kit plus Chesterville Scrapbook Papers, Slate Roofing Paper, Embossed Brick Paper, NEW Architectural Trims Digi Kit and many other bits and bobs. 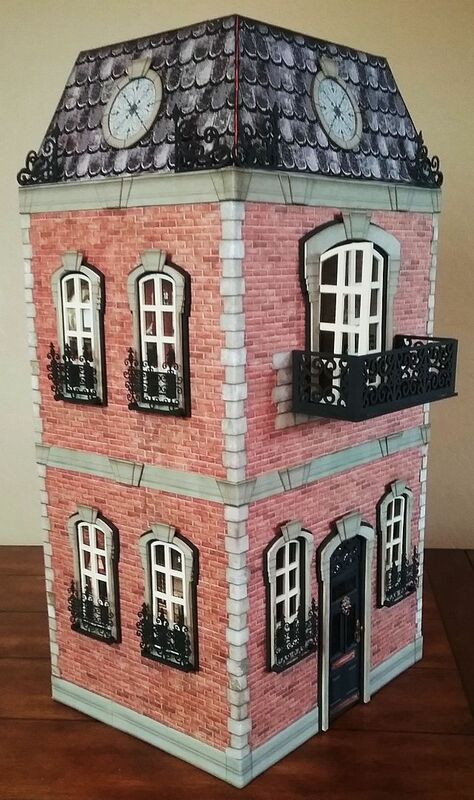 I’ve been chomping at the bit for a two-story house kit and it was fun to help design it. 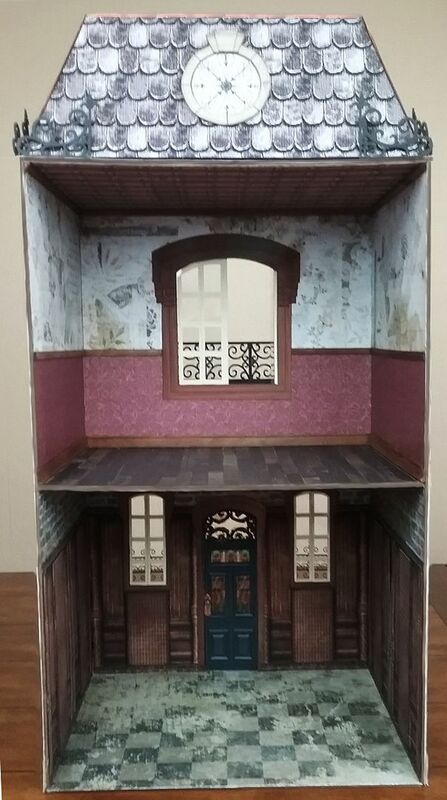 For this project, I’ve used it as a house, but it would make a great two story shop. The overall design lends itself to multiple facade styles. 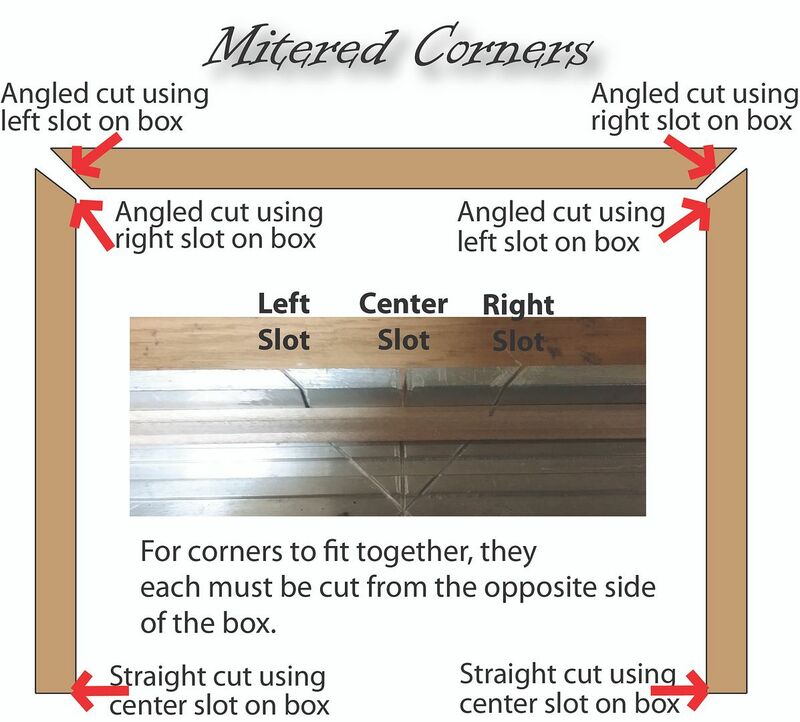 If two rooms are not enough you can use multiple kits joined together to have as many rooms as you like. 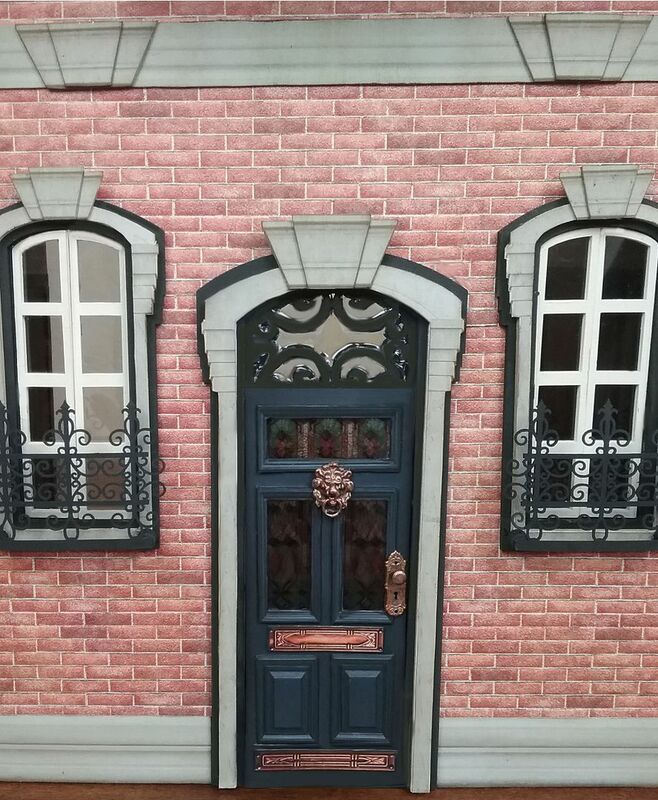 In addition to the 1:12 scale house that I've used for this project, there is a NEW Half Scale 2 Story House Kit & Roof Kit. This project is just the start, in the coming weeks I'll be decorating and furnishing the rooms and adding other elements to the exterior.